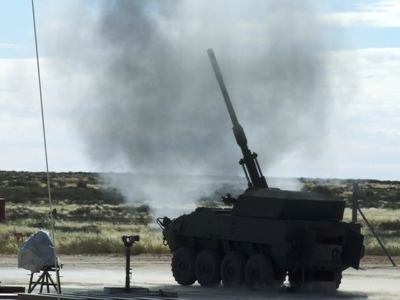 Armscor’s Alkantpan test range in Northern Cape posted a 15% increase in the number of tests conducted there in the 2015/16 financial year and was again an Armscor star performer. In its latest annual report, presented to Parliament’s Portfolio Committee on Defence and Military Veterans (PCDMV) this week, Armscor points out that 64% of the range’s total income for 2015/16 of R81,8 million came from foreign clients. Alkantpan was established in 1987 as a strategic ballistic test range for the then SA Defence Force (SADF) and the local armaments industry. Prior to its establishment, ballistic testing was undertaken at various SA Army units with no appropriate infrastructure to conduct tests safely. The range has developed into an all-purpose ballistic facility that is strategic to the DOD for conducting armaments testing in a centralised and customised manner for a variety of artillery pieces, as well as aircraft and naval weapon systems according to the report. Diehl Defence BGT from Germany and Oto Melara from Italy jointly continued conducted 127mm and 155mm artillery tests of new generation guided munitions during the year under review. Alkantpan concluded another two-year contract with Singapore Technology Kinetics Pte Ltd. (STK), which will last until March 2018. STK has been conducting tests at Alkantpan for 23 years and is the range’s major foreign client. This longstanding relationship also saw various tests undertaken for STK during the year including “new” types culminating in a request for blast trials to be conducted. “This is going to be the first time that Alkantpan conducts a blast trial of this magnitude. All indications from STK are more of these types of tests planned for Alkantpan. “In preparation for this test, Alkantpan sent an engineer to Germany for special training to capture the required data as the test requires unique measurements,” the report states adding “if the test is successful it will place the range in the forefront”. Foreign clients, at times, export weapons to the Northern Cape range and these require storage. This has seen a new weapons store, completed in June this year, built at the range with Germany already requesting storage facilities for four years until 2020. The local defence industry has also made more use of facilities at Alkantpan and Armscor sees this trend continuing for “the next year or two”.